Cancerous tumors are heterogeneous tissues with a dynamic microenvironment. They exhibit an oxygen gradient with outer regions of well-oxygenated (normoxic) tissue alongside poorly-oxygenated regions experiencing hypoxia (1). Hypoxia is essential for tumor development and many studies have shown that tumor cells in hypoxic regions distant from blood vessels show resistance to chemotherapy or radiation therapy (1). 2D cultures and the lack of an in vitro model that can recapitulate a hypoxic, 3D tumor microenvironment, are limiting to researchers who want to target cells in this context. The ability to mimic a physiologically relevant tumor microenvironment that contains an oxygen gradient would serve as a useful tool for cancer researchers studying tumor biology and potential treatments and therapies (4). HIF-1α is a transcription factor that is activated when cells experience a hypoxic environment (2). When HeLa cells are embedded into the Cell-Mate3D matrix, a hypoxic gradient is formed after 3 days (Figure 1). This is demonstrated by sectioning and staining a cross section of the matrix and performing HIF-1α staining. Imaging and analysis show that the HIF-1α staining intensity is low for in the outer 400-500μm of the matrix, and that expression is increased in the center of the matrix at Day 3. 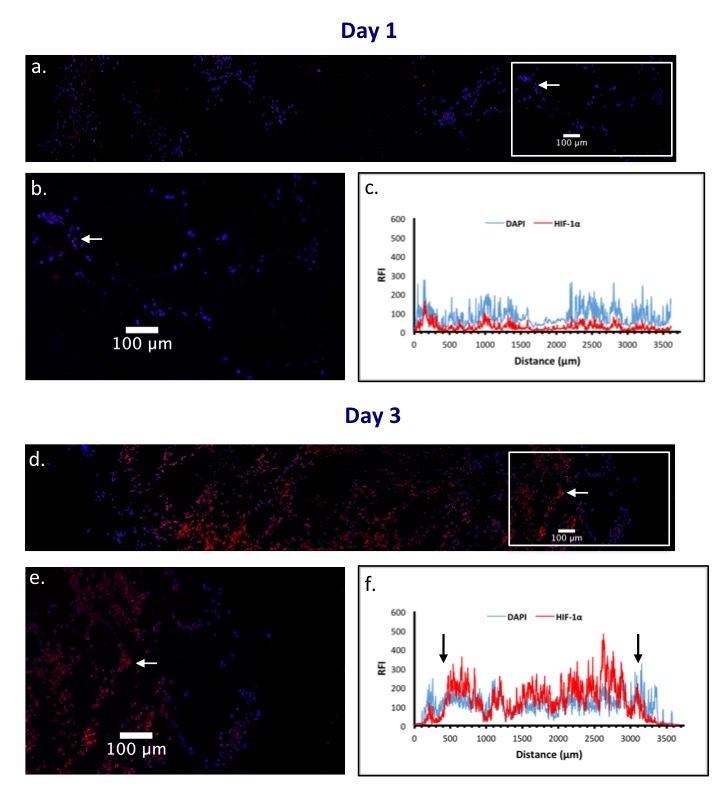 This observation indicates that culturing cells in Cell-Mate3D creates a hypoxic gradient and more closely mimics a solid tumor microenvironment compared to 2D culture. Figure 1. Cell-Mate3D cultures were created at a density of 4 million HeLa cells per 100μL of Cell-Mate3D matrix. After one day in culture, cryosectioning and staining showed little HIF-1α expression (a,b). After three days in culture, HIF-1α staining was more intense (d,e) which is indicative of hypoxia. Relative Fluorescence Intensity (RFI) profiles of (a) and (d) show that hypoxic conditions are time dependent. After three days in culture, HIF-1α RFI (red) is elevated up to four fold compared to one day in culture (c,f). Furthermore, the intensity profile of Day 3 cultures (f) indicates the presence of an oxygen gradient. The RFI of HIF-1α begins to increase approximately 400-500μm from the edge of the matrix. Want to create your own hypoxic gradient without the use of expensive chambers? The Cell-Mate3D matrix is suitable for many cell types including cancer cells, fibroblasts, and stem cells.